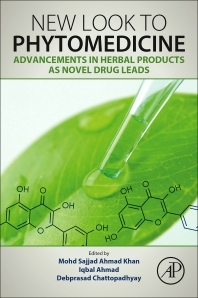 New Look to Phytomedicine: Advancements in Herbal Products as Novel Drug Leads is a compilation of in-depth information on the phytopharmaceuticals used in modern medicine for the cure and management of difficult-to-treat and challenging diseases. Readers will find cutting-edge knowledge on the use of plant products with scientific validation, along with updates on advanced herbal medicine in pharmacokinetics and drug delivery. This authoritative book is a comprehensive collection of research based, scientific validations of bioactivities of plant products, such as anti-infective, anti-diabetic, anti-cancer, immune-modulatory and metabolic disorders presented by experts from across the globe. Step-by-step information is presented on chemistry, bioactivity and the functional aspects of biologically active compounds. In addition, the pharmacognosy of plant products with mechanistic descriptions of their actions, including pathogenicity is updated with information on the use of nanotechnology and molecular tools in relation to herbal drug research. Dr. Khan obtained his Ph.D. in Agricultural Microbiology from Aligarh Muslim University, Aligarh, India. He has been the recipient of a Post Graduate Merit Scholarship and University Gold Medal in his M. Sc. Programme. He has experience of working in research projects and teaching at graduate and post­ graduate levels. Dr. Khan has been teaching microbiology, phytomedicine, molecular biology and immunology to these students. He has more than five years of research and academics experiences by serving as a Senior Research Fellow of Indian Council of Medical Research, New Delhi, India; Research Associate at Council of Scientific and Industrial Research, Institute of Microbial Technology, Chandigarh, India. He gained international experiences in research and teaching by serving as Post-Doctoral Fellow in Phytomedicine Programme with the prestigious group of Prof. J. N. Eloff in University of Pretoria, South Africa; and as an Assistant Professor in Biotechnology at Yenugnam University, South Korea. His research work had contributed significantly in the area of medicinal plants for pharmaceutical and applied industrial biotechnology and microbiology. He had published seventeen research papers and two review article in referred journals so far. He has contributed as author in seventeen book chapters. He has one book to his credit as first authorship and reviewer of more than 10 peer reviewed journals from publishers of Elsevier, Springer, Wiley, Taylor and Francis. His overall research activity has led him with a cumulative impact factor of papers published, 29; total number of citations, 633; and highest citation of a single paper being 156. His thrust area of current research work includes natural products for their novel anti-infective activity against drug-resistant pathogenic bacteria and fungi especially Candida albicans and Staphylococcus aureus focusing on anti-biofilm activity. Dr. Iqbal Ahmad obtained the M. Phil (1991) and the Ph. D. degree (1994) in Ag. Microbiology from Aligarh Muslim University and worked at Central Drug Research Institute, Lucknow (1989-1994) before joining as a lecturer at the Institute of Agriculture. Currently he is visiting Professor in the Department of Biology, UmmAl Qura University, Makkah, Saudia Arabia for a short visit since 28th May 2016. He has guided 10 Ph.D. and 52 M.Sc. dissertations, completed five Research Projects, edited 10 books and published more than 112 original research papers and 45 Book Chapters. Interdisciplinary Research work has also been conducted with experts in Applied Chemistry, Botany, Chemistry and Biotechnology. Dr. Ahmad is reviewer of various international and national scientific journals published by reputed International Publishers such as Nature Group, Elsevier, Springer, Wiley, Taylor and Francis etc. Major area of his teaching interests includes: General microbiology, Pathogenic microbes and drug resistance, soil microbiology, industrial microbiology and fermentation technology, Biomolecules, bacterial genetics and plasmid biology. Dr Chattopadhyay served as a Scientist at RMRC Port Blair and Dibrugarh during 1993-1996, and ICMR Virus Unit, Kolkata since 1997. He is one of the researchers who extensively studied the scientific basis of use of traditional medicines in primary health care of diverse ethnic communities by establishing personal contact with the underprivileged, marginalised tribal communities of India. His research includes Microbiology, Molecular Medicine and Ethnomedicinal drug development. He has one US and six Indian Patents with three leads (against HSV, Typhoid and Wound Healing) with 100+ Research publications in peer reviewed International and Indian Journals including PLoS Pathogen, Journal of Biological Chemistry, Journal of Antimicrobial Chemotherapy, PLoS One, International Journal of Antimicrobial Agents, Antiviral Research, RSC Advances etc with several reviews like Biotechnology Annual Review, book chapters, three Books, and fifty popular articles. He is in the Editorial Board of 3 International Journals, Reviewer of 37+ International peer reviewed Journals, Examiner, Ph D Guide and visiting Faculty of several International and National Universities and is the recipient of Awards like Outstanding Ethnopharmacologist Award 2016, International Society for Chemotherapy Award, DST Science Communicator Award. He is the Fellow of British Society for Antimicrobial Chemotherapy. Dr Chattopadhyay is the member of National Project review Committees of diverse funding agencies in India, has guided 10 PhD and 40+Master Degree Dissertation of various Universities, competed 9 major National Task Force Projects on Ethnomedicines of Onge, Nicobarese, Shompen, Birhore, Kattabhai, Santal, Munda etc. He is presently handling four National Projects and leading a team of 17 Scholars in collaboration with Internationally acclaimed scientists. He is now leading an Institution that integrate the traditional knowledge with the modern medicine to translate traditional information into innovation.